Kadam, whose party is currently an ally of the ruling BJP at the Centre and in Maharashtra, also noted that the Sena had won 63 seats, out of the total 288, in the 2014 state Assembly polls despite the 'Modi wave'. Kadam noted that the Sena had won 63 seats, out of the total 288, in the 2014 state Assembly polls despite the 'Modi wave'. 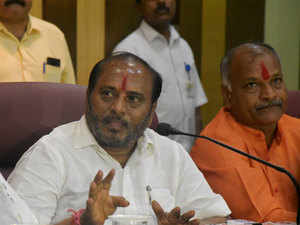 MUMBAI: Days after BJP chief Amit Shah's remarks that his party will thrash former allies if a pre-poll alliance did not materialise ahead of the Lok Sabha elections, senior Shiv Sena leader Ramdas Kadam has threatened to "bury" the BJP. "They (BJP) have already lost elections miserably in five states. Don't come to Maharashtra and threaten us or we will bury you. Don't forget that we won 63 seats despite the (Modi) wave," Kadam, who is a minister in the Maharashtra government, told reporters on Tuesday evening. In a veiled warning to the Sena, Shah had said on Sunday that if an alliance happened, the BJP will ensure victory for its allies, but if it did not, the party will thrash its former allies in the coming Lok Sabha polls. Asked about the central government'sbill to provide 10 per cent reservation in jobs and education for the general category poor, Kadam said there is already quota for the Marathas, Dhangars and Muslims. "Then how will they give further reservation to everybody? Are these decisions being taken in view of the elections?" he asked. Dhangars, who are included in the Vimukt Jati Nomadic Tribe (VJNT) category, have been demanding Scheduled Tribe (ST) status for long. The Lok Sabha had on Tuesday passed the bill to provide 10 per cent reservation in jobs and education for the general category poor with most parties backing the proposed legislation, described by the government as "historic" and in the country's interest. The Opposition, including the Congress, had dubbed the proposed law as a political gimmick that may not stand judicial scrutiny but came around to support it during voting, underlining the huge political import of the measure aimed at placating upper castes.